Grits is Southern. There’s no doubt about that. If you got grits in the Great White North it was spelled p-o-l-e-n-t-a. Grits is processed corn, and there isn’t much flavor added to most recipes . . . except cheese . . . and some of that that might be colored orange, but it’s not Florida. Let’s start putting some Sunshine State in the pot with the corn grindings. Instead of all water, use orange juice. Start with, say, one-quarter of the liquid in a small batch and see how it comes out. If you would like it more intense make the next batch with half OJ. Now what will you do with the Sunshine Grits? Serve them beside eggs fried sunny side up. For the kids, fry some bologna slices until they turn into little cups and serve the Sunshine Grits in there. Add some sugar or cane syrup and put them in orange shells for brunch dessert. Drop a few Florida blueberries on top for color and taste. We can do that now. It’s blueberry season. Shrimp and grits get new patriotism when you poach the Gulf shrimp in orange juice and serve them on Sunshine grits. Decorate the dish with orange or tangerine sections in season. Let’s add some Florida lemon juice so we can serve the Lemony Grits with fish. Fish and grits is an unheard-off breakfast a little way north. Ask around and you won’t find a preponderance of local folks who would go for the combination, either. But try fried fish with Sunshine grits and many will change their tune. Add a little more grits or a little less liquid and you get firmer grits that will slice when cold. Fry the slices in butter until just a bit brown and serve with the shrimp or fish. For dessert, top with cane syrup, Florida honey, orange syrup or blueberry sauce. A Po’ Boy sandwich is rich in taste, and, when made with pricey oysters, you can’t be too po’ to afford one. Harkening back to New Orleans, one story says the sandwiches were given away to street car workers on strike in the ’20s. Both came to be called Po’ Boys. What makes this sandwich different from most others is the bread. Loaves are traditionally 32 inches long with a fluffy center and substantial crust. Wait, doesn’t that sound a lot like the Cuban bread we have grown to know and love in Florida? Using the technique of the Cuban sandwich and Florida ingredients we have a variation we could call a Cracker Boy. Remember where you put your Panini press for later and let’s get to work. Blend butter and orange juice (or mayonnaise and orange juice) to slather the bread if you’re going to serve the sandwich cold and crisp. Take some of the shrimp you poached in orange juice and are now well chilled and layer them on the mayo or buttered halved bread. Top the shrimp with Florida lettuce and sliced tomatoes if you like them. Thin slices of cucumber add moisture and crunch. Anything else you can think of can go on now. Cut into lengths to suit the diners and serve up your Cracker Boys to Cracker guys and gals. The sandwiches can be well wrapped and chilled to come out later at a picnic or game. The same cooked shrimp can be chopped for salad with a splash of hot sauce to boost the orange flavor for interest. Now let’s go get the panini press and get to work on a Pressed Cracker Boy. You need some freshly cooked shrimp or local fish to do it Florida style. Dredge the main ingredient in corn meal with a good dash of cayenne pepper or hot sauce. Datil pepper sauce comes from St. Augustine—and only St. Augustine. It’s made with tiny peppers that have a definite kick. Check supermarkets and roadside stands for a bottle. Check the Internet for seeds and grow your own. 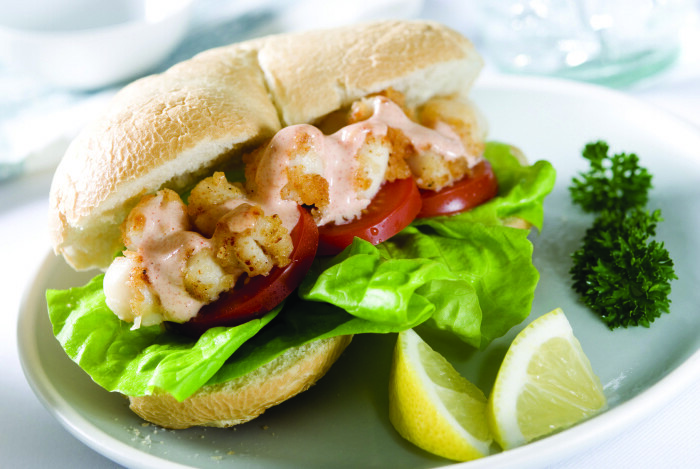 Paint mayo (with or without orange or lemon) on the Cuban bread and then add a good layer of cooked fish or shrimp. Butter the top and bottom of the bread and tuck it into the press. In a few minutes you have a crispy Florida creation that rivals any Po’ Boy in Na’wlins.